This time I decided to list the ingredient measurements as well as the method, in a dish like this, proportions are a little more important due to all ingredients being raw at the start. 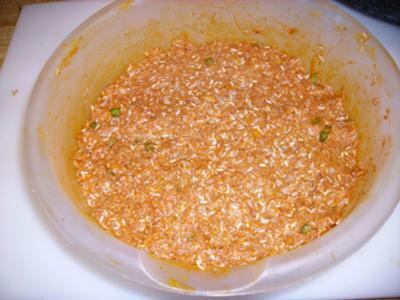 In a large bowl mix raw beef, rice, onion, pepper tops, 2 c. spag sauce, garlic, salt, pepper, and Mrs. dash. Mix thoroughly so everything is incorporated evenly. Let flavors blend while pre heating your oven. 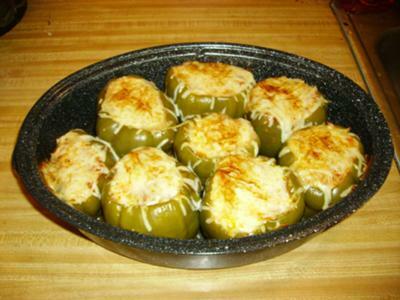 Put filling in peppers leaving about ½ inch at the top. Cover tops of each pepper evenly with shredded mozz. cheese. Place in solar oven for about 3 hours (temp range of 275-325 degrees F.) adjust time accordingly to your oven’s average temp. When done, temperature of filling in peppers should be 175-180 degrees F. to insure that the beef is well done. I heated the extra sauce in a quart mason jar using a Fresnel lens from and old projection tv. I made sure it was off-focus so as not to burn down my yard, (see pic) and had the sauce up to 180 degrees in about 45 minutes. Conditions were 82 dgrees, and mostly sunny with no wind. I don’t see any way to make this easier, but am open to suggestions. I have included pictures to hopefully goad you all into trying it. Let me know what you think. Nice writeup...detailed description and great photos. 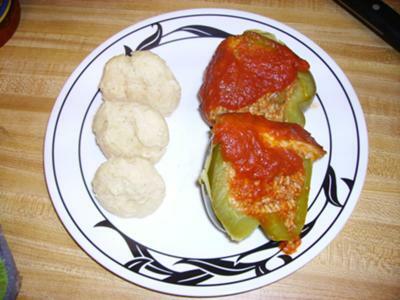 Thank you so much for sharing the recipe of the solar stuffed peppers. I use a solar cooker and would like to try this recipe for me. Thank you so much for explaining the cooking steps so clearly. 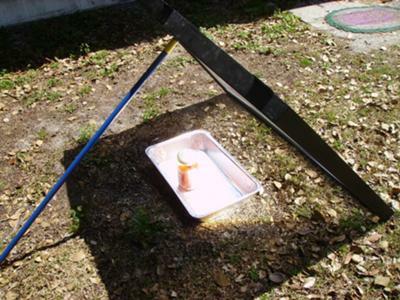 Keep up the great solar cooking.